Hot tub distributor Certikin has been given a spring boost with a successive Caldera Spas International Dealer Award by its top network of retailers and introduction of two new models to the British market. The thriving wet leisure product powerhouse is proudly promoting the momentous achievement of gaining the much-coveted Caldera International Dealer Award for 2017 for its distinguished performance in sales, marketing and customer service. That in itself would be outstanding news for the UK dealer network, but the fact that it is the second year in a row that Certikin’s dealers have won such a prestigious award is an historic achievement. Caldera Spas dealers are now gearing up to attempt to achieve the international award hat-trick with the help of a brace of extra additions to their range of options with the introduction of the Florence and Provence from the booming production line of Watkins Wellness. Coming in at 213cm x 213cm x 91cm, the six-seater Florence, pictured, is a new fully-featured Utopia Series option with open seating. It is joined by the new Provence, coming in at 213cm x 198cm x 89cm. 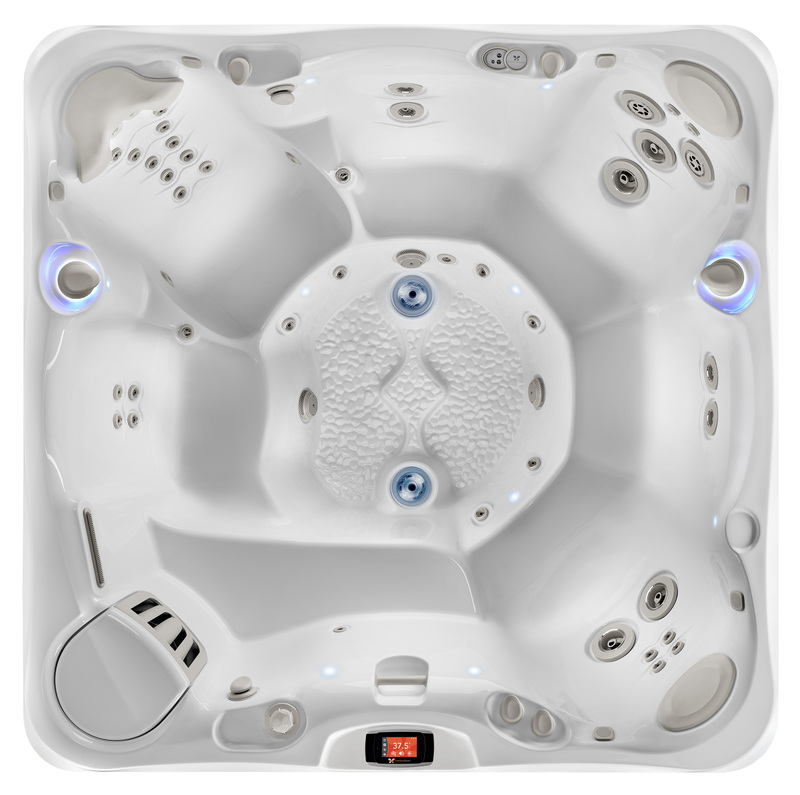 This is a four-person model that has been launched to meet consumer demand for a smaller spa with twin lounger seats. 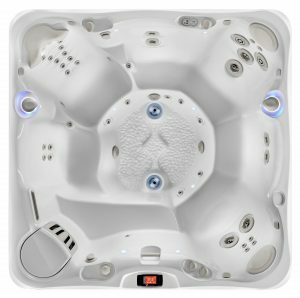 Watkins Wellness has also introduced a new touchscreen control panel on all of the 2018 Utopia Series hot tubs. The Advent LCD touchscreen control panel features a full colour menu with user-friendly navigation. It has 180° screen rotation capability, a waterproof screen, sealed housing and a built-in light sensor for automatic dimming functionality at night. Owners can also utilise the memory function to save their preferred settings. There is also easy functionality to access the automatic clean cycle and hot tub temperature display from the home screen. Certikin Sales Manager for Portable Spas, Monopools & Enclosures David Steptoe is now aiming to help dealers achieve even further success; after the perfect culmination of his first year with overall responsibility of the Caldera Spas network. David has thanked manufacturer Watkins Wellness and the UK’s Caldera Spas dealers for helping to achieve the back-to-back international award double status, after highlighting the benefit of supplying the network with high-quality products. “I’d like to send sincere thanks to Caldera’s manufacturer, Watkins Wellness and also all our fantastic, hard-working dealers, without whom this award would not have been possible,” said David. “Caldera Spas are the best spas in the world for performance, comfort and style. Certikin is fortunate to be able to supply its customers with such an outstandingly high-quality product. Certikin is also currently ramping up the search for dealers to join the Fantasy Spas network of showroom dealerships in the UK. The distributor believes the Fantasy Spas range provides dealers and their prospective customers with unparalleled quality at an affordable price and, with a polyethylene resin rotational mould, they represent a light-weight alternative to the traditional acrylic spa. Easy to set up, simple to use and maintain, the five ‘plug and play’ Fantasy Spas options only require a 13-amp supply and are highly portable. They are built to withstand the elements, and are ingeniously designed to give maximum seating comfort by Watkins Wellness. Thanks to intelligent engineering, the walls of each Fantasy Spas model are filled with polyurethane insulation to ensure low operating costs; while the high specification includes dual speed therapy systems, electronic digital controls, an energy-efficient 1 KW heater, mood lighting and insulated cover. For further information about becoming a Caldera Spas or Fantasy Spas dealership call Certikin directly on 01993 778855.